When our son turned six earlier this year we decided to buy him a camera, but instead of getting a kid-friendly camera we got him what he calls a real professional camera. You know, the kind for adults like daddy has. He has shown a great interest in taking pictures in the past year or so and we wanted to encourage that by giving him a real camera with real controls that could take real pictures, but at the same time we didn’t want to break the bank in case he broke the camera. Our solution was a Canon Powershot SD450, which was small and light enough to be pocketable but had all the options and controls of an actual camera. Because it is an actual camera, even though it’s not exactly the most current high-tech touchscreen model. And the beauty of the whole situation was that we only paid $25 for it on eBay, and even though it arrived with a couple of scratches and dings he has used it extensively ever since and jumps at the chance to use his “real professional” camera to take pictures of anything and everything he comes across. 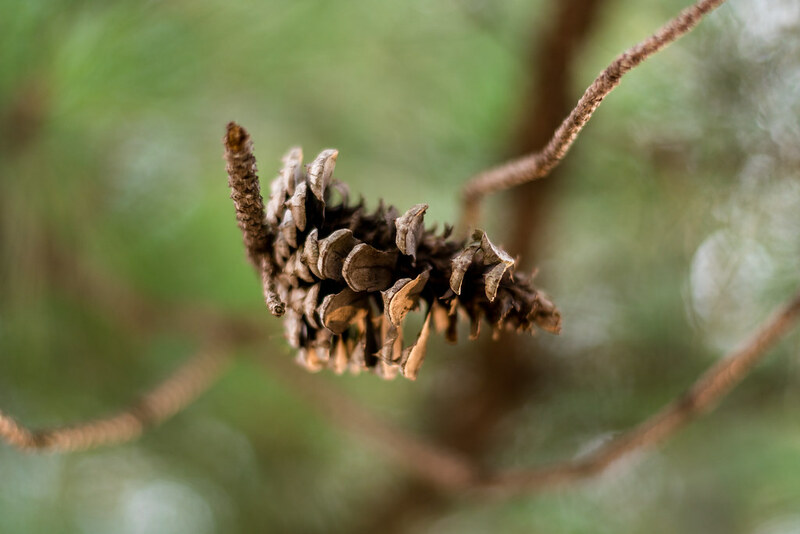 As we neared the end of our Photo Walk I saw this pinecone basically hovering in midair, suspended by only a thin branch which you can’t really see in the picture. I thought it would make for a fun picture, and a nice opportunity to get a super blurry background too. As usual it took a couple of tries for me to get it right, and of course both my kids wanted to get in on the photo action too, and in the end not only do I have a photo I like but a fun story to go along with it. Guess I better have my hair dry before you arrive on your next visit, or else the boys’ cameras will freeze and capture that image! Very cute story. Your kids will cherish the time spent with you and in the process learn a life long hobby or may be a profession. Nice image and great story. The times I spent with our children when they were young observing the details of nature are great memories. Take advantage of this time when your boys will go with you and enjoy spending quality time together. My 15 year old wants to borrow my camera. But she wants to go out on her own, no Mom to tag along. It still makes me happy to see her enjoying the craft of photography. Nice a chip off the old block, an apple fallen not too far from the old tree, a son following in his dear old dad’s footsteps! Oh, my, me thinks I used the word “old” one too many times, don’t you? Hahahaha! Tom, you never fail to crack me up! I have an adopted grandson who likes to take pictures when I am with him. Your idea of buying second hand from ebay has inspired me to do the same and give him his own camera. When I let him handle my camera I break out in cold sweats. Great idea.